A coloured lithograph shows the School of the London Society for Teaching the Blind to Read from the road, as passerbys hurry past. The school is a stately brick building surrounded by foliage. Coloured lithograph by E. T. Dolby, n.d., after H. E. Kendall, 1838. Courtesy of the Wellcome Library, London under a Creative Commons License (Wellcome Library no. 38645i). “Blind Guy Fawkes” is noteworthy for how it both participates in and diverges from a representational pattern. The introduction into Britain of raised-print books in the first decades of the nineteenth century and the proliferation of finger reading skills that followed resulted in both the founding of new schools and charities dedicated to the education of blind people and extensive press coverage of the accomplishments of this newly literate group. This article, which was published anonymously in Charles Dickens’ weekly family magazine All The Year Round, describes an evening visit to the London Society for Teaching the Blind to Read, a boarding school for young people with visual disabilities founded in 1839. While its author describes both the academic and vocational training provided by the Society, he or she chooses to open with and focus on the students’ rowdy celebration of Guy Fawkes’ day. Portraying a group of blind students as playful, pleasure-seeking, and energetic, the article’s author eschews the highlighting of difference, common in articles of this kind, in favor of an emphasis on experiences, aptitudes and interests that this group of blind children hold in common with sighted children. While many articles on the education of people with visual disabilities published in the period portray blind students as industrious, serious, devout and suffering, this article offers a more nuanced portrait, in large part by withholding information about the disabilities of the children being described. Information about the location of this celebration and the children’s visual disabilities is withheld for several paragraphs. It is only after describing the rowdy behavior of the children and their agility and pleasure that the author identifies them as having visual disabilities. While the article opens with an expression of pity, “Poor Guy!,” the pity expressed is for the effigy of Guy Fawkes and not for the children, who mark the anniversary of Guy Fawkes’ treason in the same spirit and in the same way as sighted children: by preparing a Guy for burning and by setting off fireworks. The result is a progressive, straightforward and positive portrait of blind children and of the everydayness of their lives. This is not to suggest that this article avoids all of the pitfalls common to the Victorian press’ handling of the experience of visual disability. The author describes visually disabled people as “people to whom life is one long Arctic night, unillumined by lamp of heavenly or earthly make,” a poetic lament of a kind common to reporting on disability. Similarly, the author’s discussion of blind people’s use of the word “see” to describe experiences of perception has a regrettable ethnographic feel. While the reporter is eager to share an anecdote that demonstrates the capabilities of a group of blind boys (a story about how they detect and punish an unwelcome sighted boy who spies on them by dunking him in a trough), he or she doubts a story that the students share about the existence of a highly successful blind housewife. While the author focuses on the experiences of students with visual disabilities, the article also caters to public fascination with the experiences of people with multiple sensory disabilities, fascination well documented by the century’s extensive press coverage of the education and lives of Laura Bridgman and Helen Keller. In this article, the author portrays a blind and deaf basket maker as a skilled and diligent workman but dwells on his isolation from fellow students and on his exclusion from the night’s celebrations. This representation of a blind and deaf person links the article to a section from American Notes (1842) in which Charles Dickens described his visit to the Perkins School for the Blind in Boston, both celebrating the accomplishments of the rapidly developing field of blind education and lamenting the presumed suffering and isolation of Laura Bridgman, the school’s star pupil. While both “Blind Guy Fawkes” and Dickens’ American Notes expressed and catered to public interest in the education of people with disabilities, they differ in their portrayal of blind children. “Blind Guy Fawkes,” with its lively descriptions of bold and boisterous children, is a reminder to modern readers that press reports on educational institutions for people with disabilities are far from homogenous in their approach to their shared subject matter. They document different facets of the lives of people with disabilities and, in doing so, they communicate different ideas about disability. Poor Guy! He is burning as he has burnt any time since that fifth of November on which he attempted to “blow Scotchmen back to Scotland.” He is blazing in the midst of tar-barrels and brushwood. The great bonfire pouring out masses of flame and sparks—careful officer of the Fire Brigade keeping watch meanwhile—lights up an odd scene. We are in a great square on a November night, dim walls enclosing it. Rockets are shooting far into the wintry sky, Roman candles are jetting out starts of many-coloured flame. Catherine-wheels whizz round on tree trunks; squibs are spurting our their short but sparkling life; crackers banging and barking on the ground, noisy, demonstrative, and soon extinct, like fussy politicians; and, besides all theses, there is plenty of high pyrotechnic art from Mr. Brock’s famous laboratory—set-pieces, Chinese trees, fiery fountains and the like. Plenty of noise, plenty of fire, and plenty of light. Round the bonfire dance merry figures –rushing hurriedly now and then to the window whence the fireworks are liberally dealt out—exulting in the noise, the crackle, the fun generally; glorying in Guy Fawkes and his sublime cremation. They are “knowing,” these shadowy forms of boys and half-grown men. They keep the fire at a respectful distance, save when one, bolder than the rest, gives a tar-barrel a kick to bring out the sparks in golden showers. They never light their fireworks at the wrong end, as has happened to philosophers before now, but manage them deftly and skillfully. They are enjoying themselves immensely; and, as they last glorious wheel dies out, the last cracker and the last maroon explode, they open their throats with a hearty cheer—a three times three- in honour of, it may be supposed, the Protestant succession. They have thoroughly enjoyed the festival of St. Guy; and, when the embers on the fire sink low, go indoors to bed, satisfied, but not satiated, with the fun of the evening. The odd part of this fête is that the celebrants are blind—many of them wholly unconscious of the light of the day, people to whom life is one long Arctic night, unillumined by lamp or heavenly or earthly make. There are others who, although their blindness is unhappily complete enough to prevent them from distinguishing objects, yet they are dimly conscious of sunrise and sunset. The latter enjoy the fireworks keenly, perhaps more keenly than those who see perfectly; but it is difficult to understand the fun of fireworks to the utterly blind. That they produce no effect on some people, is proved by the demeanour of the industrious man, who has retreated out of the noise and bustle into a quiet corner in the dark, and is working away at basket-making as if his life depended upon getting that pretty basket, with the white and red stripes, done this very night. The glare of the bonfire, when the flames shoot up on this side, just reveals the pattern of the work on which he is busied; but he is otherwise so completely in the dark, that ordinary people can barely make out his figure in the corner. He is absorbed in his task. Great wheels spin round unheeded by the basket-maker; maroons thunder out their warning in vain. One perpetually moves his busy fingers among the osier-meshes, woven with strips red or white, selected with unerring accuracy but this one solitary man who cares not for Guy Fawkes or his fête. Alas, poor fellow! He cannot “remember the Fifth of November,” for he has never heard of that or anything else. He is not only blind, but absolutely stone deaf; yet is he a capital basket-maker; and an honest and good-honoured fellow, if you only know how to talk to him by taking one of his hands, and touching it rapidly in various parts, as Miss Quarman is now doing. He is not absolutely dumb, but articulates a few words—a very limited vocabulary—and then goes back to work with a will, ignoring the high jinks going on around him utterly and completely. But the boys who are only blind are as “jolly” as those proverbial youths whose birth or occupation is associated with “sand.” Miss Quarman and Mr. Sander have as much as they can do to distribute Roman candles, squibs, and crackers to the numerous applicants, who appear singularly well acquainted with the properties of various kinds of fireworks. It is difficult to realize that these boys are blind. When hurrying towards the window they never miss it, and, what is stranger still, never blunder over one another; and they have the keenest appreciation of the difference between a squib and a cracker. The Roman candle and the Jack-in-the-box are the prime favorites, next comes the cracker, and lastly squibs and golden rain. The triumphs of pyrotechny—set-pieces, wheels, and coloured rockets—are comparatively unheeded, a single maroon being worth a boxful of them. For more information on Victorian Britain’s sometimes violent celebration of Guy Fawkes day and on attempts to suppress these celebrations, see J.A. Sharpe’s Remember, Remember: A Cultural History of Guy Fawkes Day (London: Harvard UP, 2005). Founded in the early 18th-century, Brock’s Fireworks, later known as C.T. Brock & Co.’s Crystal Palace Fireworks, was a fireworks manufactory located in the south of London. It was known both for the accidental explosion of its Whitechapel factory in 1825 and for holding successful fireworks displays for the public, known as Brock’s Benefits. The Society for Teaching the Blind to Read was founded in 1838 and was located at 1 Avenue Road, Regent’s Park, London. A Guide to the Institutions and Charities for the Blind in the United Kingdom, published in 1884, explains that the Society’s goal was “to provide instruction for the Blind in ordinary branches of Education, with music, in a resident school; also to teach them trades” (31). At the time the Guide was published, the Society had 26 females and 30 male student boarders. In “The Blind of London,” an essay published in The Times in 1860, Edmund Johnson noted that the primary object of the Society was “to teach the blind to read, with an especial view to their eventually reading the Holy Scriptures” (16). He goes on to explain that no student, no matter how eager he or she might be to “acquire knowledge of an art of a more material advantage” is permitted to “learn any of the additional branches of instruction until he or she can read tolerably well in one of the Gospels, an acquirement generally made within three months of his or her admission.” (16). 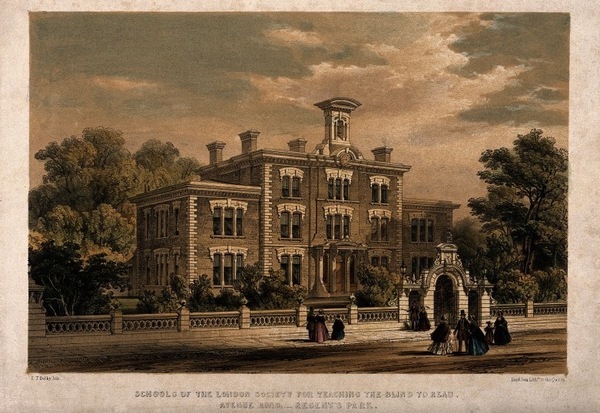 The Guide to the Institutions and Charities for the Blind in the United Kingdom notes that female students were taught to knit, while male students learnt how to print books in the Lucas embossed script. Boys also learnt chair caning and basket making. The “Lucasian” system referred to here is one of many raised-print script systems developed and used in the course of the nineteenth-century to print text to be finger read by blind readers. It takes its name from its inventor, Thomas Lucas. The author uses references to Herodotus, the famously cautious ancient Greek historian, and to John Maundeville, the 14th-century world traveler, who is believed to be as mythical as the ‘facts’ about foreign places attributed to him, to express skepticism about the housekeeping and parenting abilities of a visually disabled woman. “Blind Guy Fawkes.” All the Year Round (November 25, 1876): 255-258. Gitter, Elisabeth. The Imprisoned Guest: Samuel Howe and Laura Bridgman, the Original Deaf-Blind Girl. New York: Farrar, 2001. Johnson, Edmund C. The Blind of London. London: John Mitchell, 1860. Oliphant, John. Early Education of the Blind in Britain, ca. 1790-1900: Institutional Experience in England and Scotland. Lewiston, NY: Edwin Mellen, 2007. Turner, Mansfield and William Harris. A Guide to the Institutions and Charities for the Blind in the United Kingdom. London: Simpkin and Marshall, 1884. Warne, Vanessa. “‘So that the sense of touch may supply the want of sight’: Blind Reading in Nineteenth-Century Britain.” Media, Technology, and Literature in the Nineteenth Century: Image, Sound, Touch. Colette Colligan and Margaret Linley eds. Aldershot: Ashgate, 2011. 43-64. Anonymous, “Blind Guy Fawkes,” Nineteenth-Century Disability: Cultures & Contexts, accessed April 23, 2019, http://nineteenthcenturydisability.org/items/show/10.